Much like the Lost World of Tambun, which we visited earlier in the year, Sunway Lagoon was a theme park I had seen many times. It always seems to be pictured in Air Asia magazines, on board flights and in destinations around Malaysia. I have wanted to go for years especially since they opened the Nickelodeon Lost Lagoon section of the park last year. It looked like lots of fun for our family. 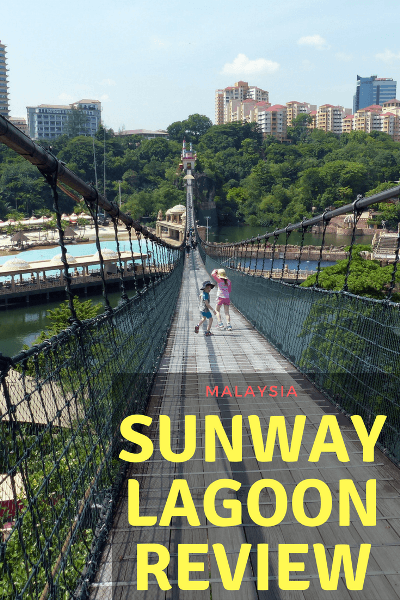 This trip we had a three night stopover in Malaysia on our way to Mauritius and it was the perfect opening to finally knock Sunway Lagoon off our bucket list. In fact, Sunway Lagoon and the adjoining shopping centre and hotels make for the perfect break if you are stopping over in Malaysia as it’s only about 40 minutes drive from the airport. It’s also very close the centre of Kuala Lumpur so it’s easy to spend a day here while you are visiting Malaysia’s capital. So, is it worth visiting? We had a lot of fun at this theme park and it’s easy to spend an entire day here. There is plenty to do with six different lands to visit. The video was filmed from one of the coolest Sunway Lagoon attractions – a long suspension bridge which hangs over most of the park. It’s a fun way to check out everything. 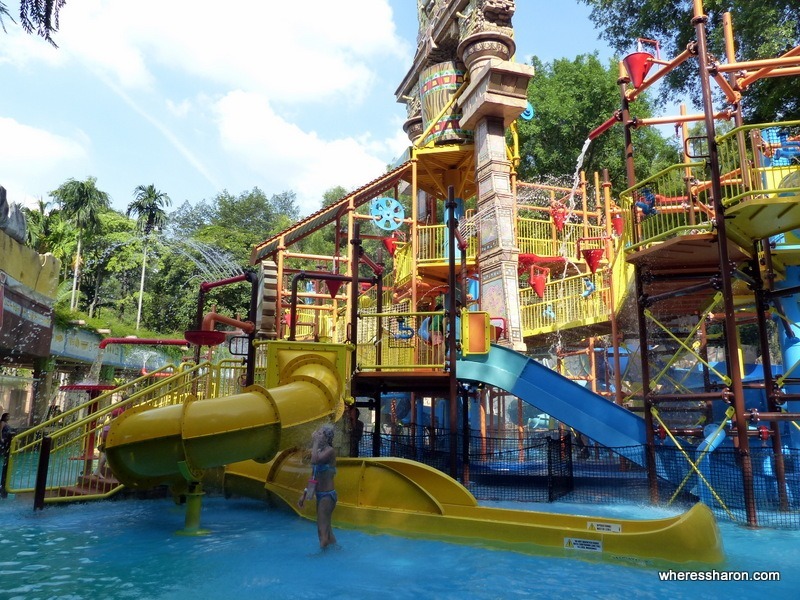 We visited Sunway Lagoon with our three kids aged 12 months old, 5 and 7. 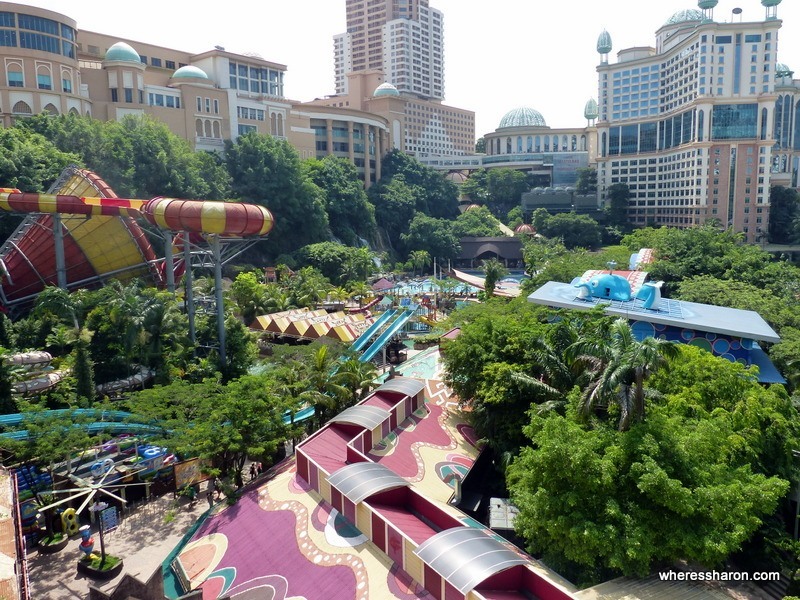 There are six different lands, each with their own Sunway Lagoon activities. 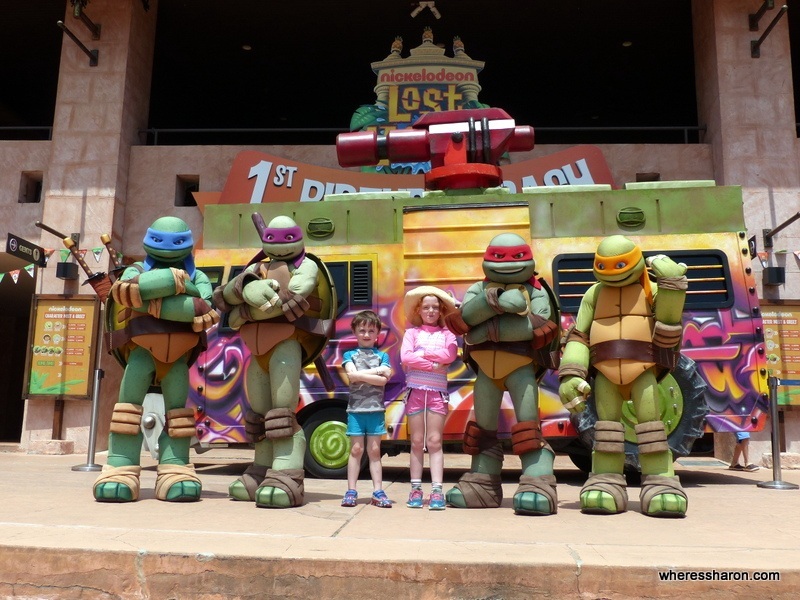 Below, I will describe each of them in our Sunway Lagoon theme park review. On entry, this was the first land we entered. It had a Wild Wild West theme. This is where the majority of the dry land rides are and we had fun flying around on planes, cooling down as we were splashed in the Grand Canyon River Rapids ride and spinning around in the Apache Pots. 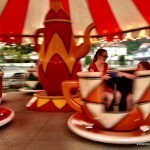 Most the rides are suitable for young kids and we had fun. There is also a roller coaster (which wasn’t open) and a 360 degree rotating ship that the kids were too small for (and wouldn’t have wanted to do anyway). There were no lines when we visited and we quickly zipper through everything we wanted to do. The Scream Park is in the middle of the Amusement Park and is primarily for adults with their “live action scare extravaganza”. This is basically a huge haunted house with some Ghostbusters theming at times. There is a zombie area where I felt like I had entered The Walking Dead. There were many zombies thrashing around seemingly trying to eat us. It’s quite a unique attraction with many actors making sure everyone screamed at some point. I mostly thought it was funny, rather than scary, but I’d be lying if I said I didn’t scream a few times. It was different for S. They only allow kids 7+ so thankfully Z stayed outside. S found it quite scary and cried at one point. By the end she seemed to love it and was proud that she got through it, but I would have left her outside had I known how she would experience it. She is easily freaked out though. The Extreme Park is for adults and teenagers and includes activities like bungy jumping, go karting and ziplining. It looks like lots of fun but, since we were visiting with young kids, we skipped it. 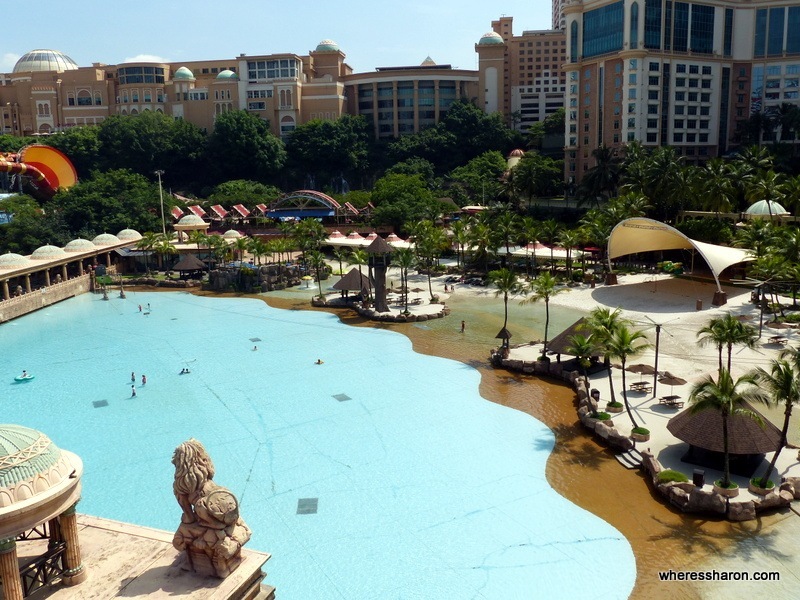 The Water Park is probably the core area of Sunway Lagoon. There are several pools and water playgrounds including a wave pool, a normal pool with a toddler area and a water playground for younger kids that Baby J would have liked. Out of the water there was a “5D” ride with a 3D movie and a lot of water splashing all over you. It scared Z (it was pretty fast) but it was a lot of fun. The Water Park is also home to the “Zimbabwe River” a lazy river for which you could rent inflatable rings to sit on and float around. However, unlike a normal lazy river, there was no current so you’d have to power yourself. Much better was the wave pool. The waves weren’t big but big enough to make it fun. Plus it had a stage and we were treated to a dance show while we swam at one point. The Water Park is unsurprisingly home to the biggest water slides in the whole Sunway Lagoon including their pride and joy, the Vuvuzela. This area has the most food options of the entire park, including Subway, Starbucks and local chicken chain Marrybrown plus a ton of others. If there is a downside to this area it’s that the rides/slides weren’t for young kids. They were all too big, fast or scary. Older kids will love this area though. While the surf beach is part of the Water Park it feels separate and distinct and is worth its own section. 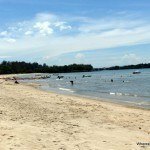 The Surf Beach combines Asia’s largest artificial wave pool with a real sandy beach area. The “surf” only goes for an hour for swimming (from 3pm when were there) and it is worth experiencing it. The waves are quite big if you get close to the source (they can get up to 2.5 metres when it’s used for actual surfing) but are small by the time they hit the beach. It works for all ages. S and Z really liked them as they broke like real waves from the sea and were a lot of fun to jump into. What makes this area really great for parents is that everything else is right there just off the sand – toilets, lockers, change rooms and plenty of places to sit in the shade and watch. Plenty of people left bags and gear around rather than use a locker and there’s no reason you couldn’t if you didn’t want to fork out for a locker. Food wise this area had a great looking Malaysian stand as well as a Burger King and barely a line at either. Both of those – plus plenty of places to sit – were a stone’s throw from the water’s edge. While the Surf Beach might have been our favourite activity, our favourite area was the Nickelodeon Lost Lagoon. 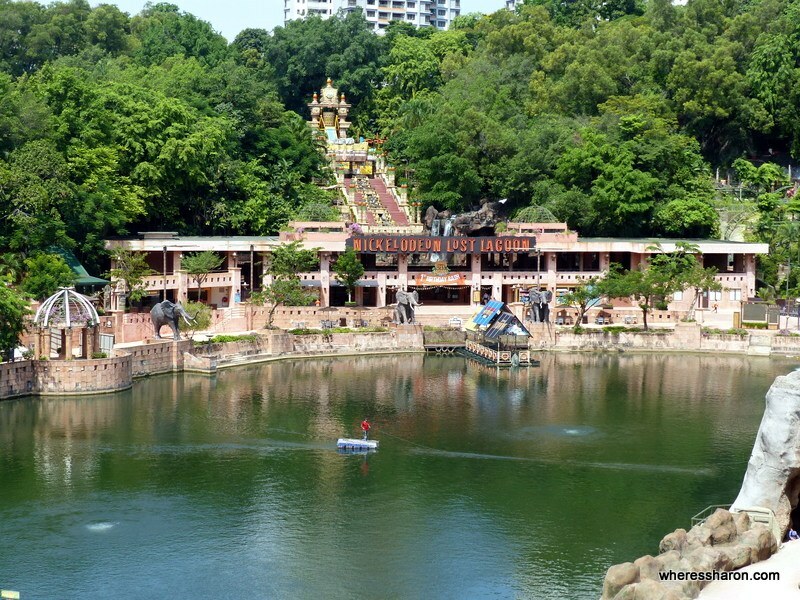 There are lots of things to do in Sunway Lagoon here. 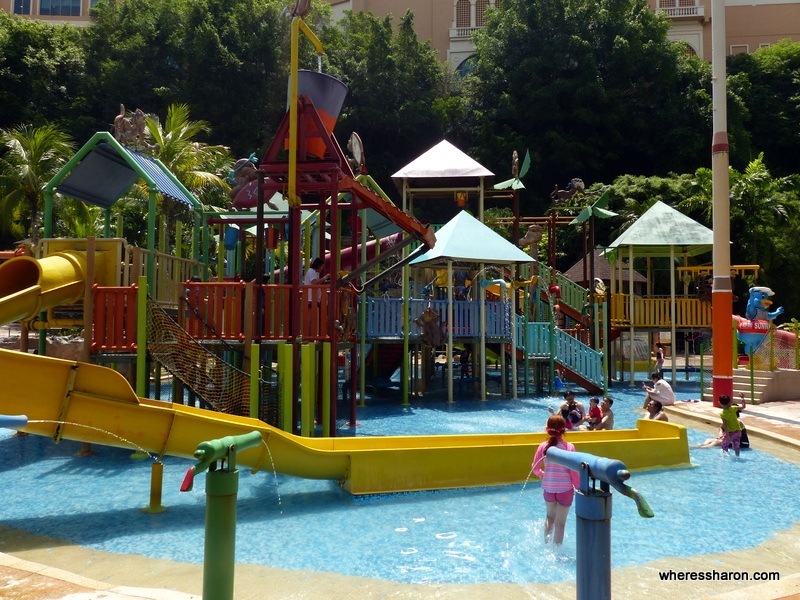 There are a couple of great water play areas with the SpongeBob Splash Adventure area (which was better than its Water Park counterpart) and Splish Splash. The rides also suited families better as they were way less extreme. We came to the area last and we didn’t have that much time left to spend, but we could have easily spent most the day here. In addition to the water activities, there is also some bonus stuff like meeting with some Nickelodeon characters (we saw Sponge Bob and Patrick plus all of the Teenage Mutant Ninja Turtles) and a “slime party” where the Splash Adventure’s giant bucket tipped out “slime” instead of the usual water. It wouldn’t have suited Baby J as well as the main water park as there was less in the way of shallow areas. Otherwise it’s great for kids of S and Z’s age and up who may be too young to enjoy the bigger slides in the Water Park. There were a couple of misses with the Lost Lagoon, as good as the area was. First was the lack of food options. There are five places to eat but other than the pizza place none were that great and were generally pricier than other options. None are close to the water attractions. The second was the rides. S was big enough to go on most of the rides unaccompanied but couldn’t because they either insisted on a minimum group size (for the Jungle Fury) or using two person ring thing which S couldn’t carry (as happened with the Primeval ride). This made it hard since we visited this area with just one adult and two kids and Z did not want to do them or was too small. The Wildlife Park area is small but it has quite a few animals and is worth checking out. 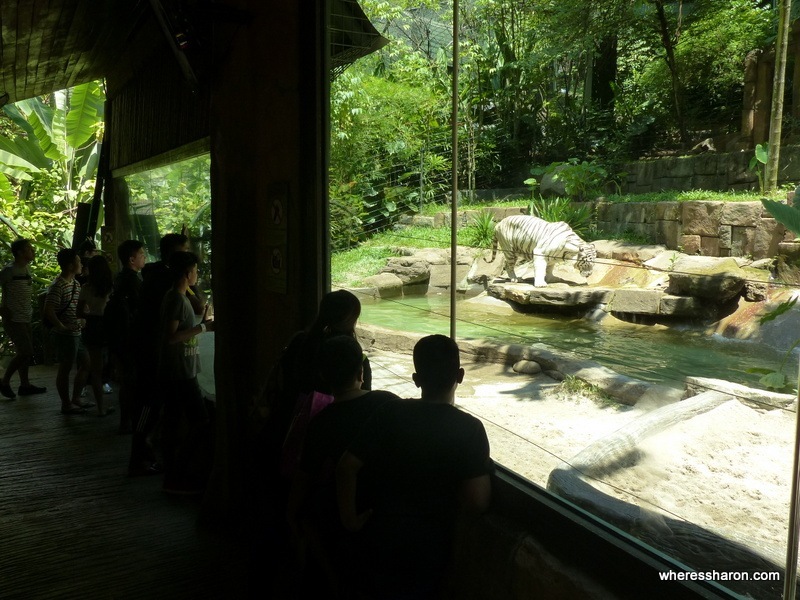 The star attraction is the Lagoon’s new White Tiger (a near totally albino Malayan Tiger, not a Siberian one). At the feeding times you could see this huge cat up close (behind a glass wall). It was pretty cool to see. There are feeding times for other animals, too, like the Sun Bears. For nearly all the animals you could get a good view. It’s no zoo – the enclosures are on the small size – but the animals seem well treated. There’s also a petting zoo area as well as a daily animal show. Not as appealing as the rest of the park for the kids, but they still liked walking through and checking out the animals on the way. We had a great time at Sunway Lagoon and I can see us returning again in future. 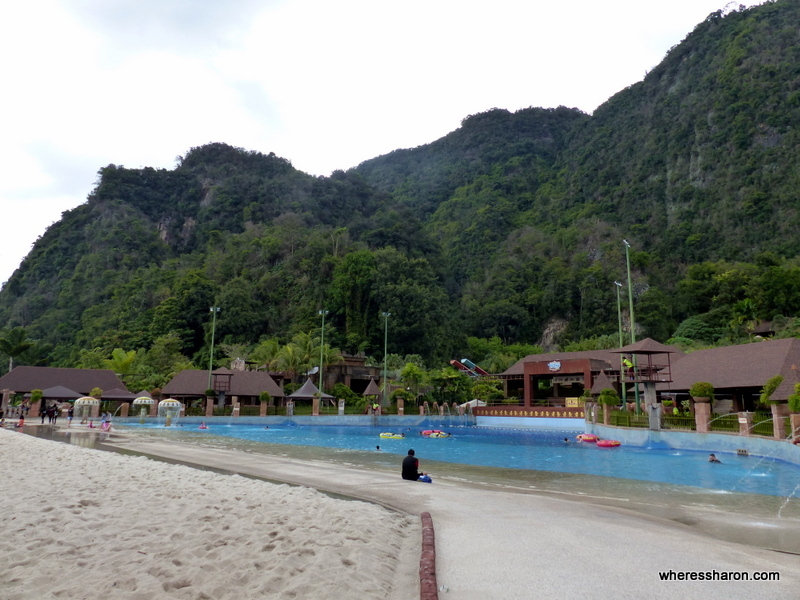 It’s an easy trip from KL and we loved spending three nights just enjoying everything Sunway has to offer. We visited on a Monday in June and avoided the local school holidays. This was both good and bad. Good in that there weren’t many people and we didn’t need to line up for anything. Bad in that many attractions were shut which is probably my main criticism of the place. This didn’t really matter as we had plenty to do and wouldn’t have had time for more anyway but it would have been nice if one of the roller coasters were running for example. The park is very well presented with lots of greenery. This helped to keep it cool and made it quite pretty. It did not feel like we were in the middle of a sprawling metropolis at all. Sunway Lagoon is not the place to go for thrilling rides. I would describe it more as a great water park which also has some rides and animals. Some of the rides are looking tired but they were still fun. 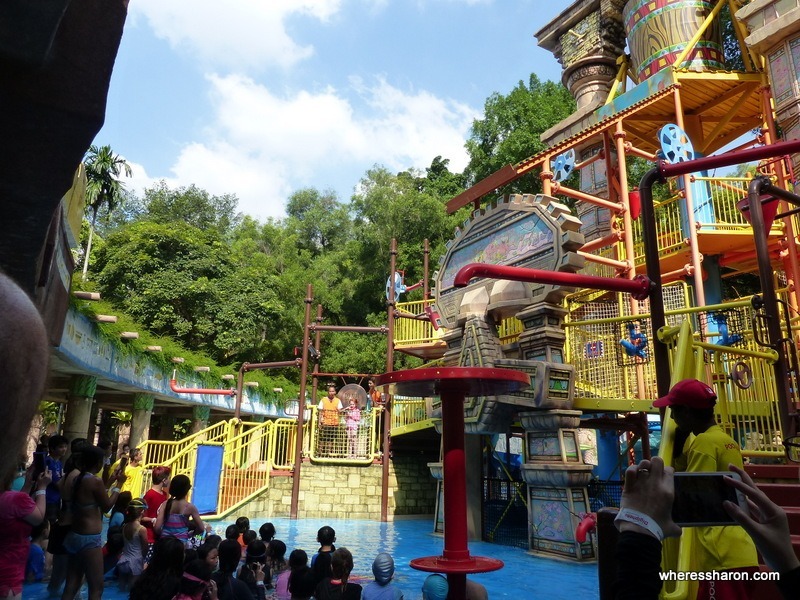 We loved having a Sunway Lagoon family day. We loved the Water Park and Nickelodeon Lost Lagoon. The wave pool was big and lots of fun. The whole of Nickelodeon Lost Lagoon was great. The kids absolutely loved it and this is a great choice for younger kids. It was all lost on our 12 month old, of course, but the older kids lapped it all up and liked the extras like meeting the Teenage Mutant Ninja Turtles and SpongeBob. 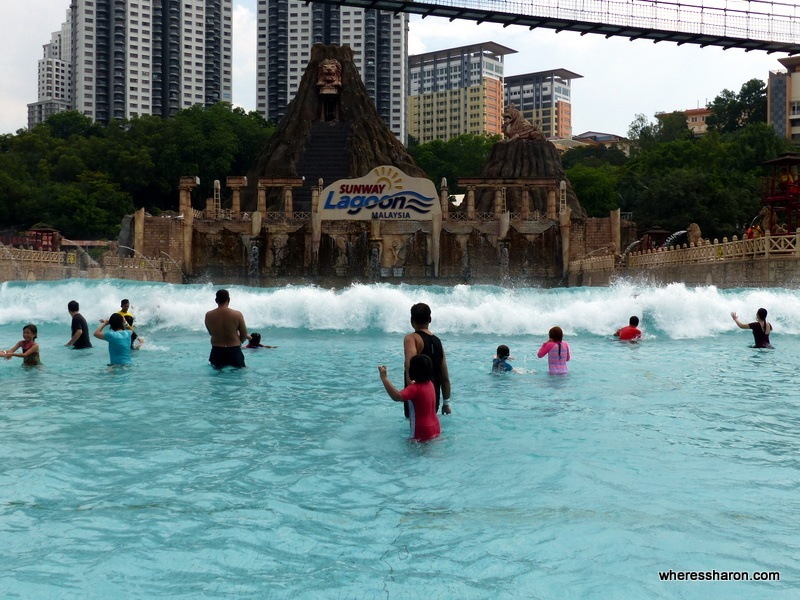 Sunway Lagoon gets a big thumbs up from us! You can find more information on their website or Click here for discounted tickets. 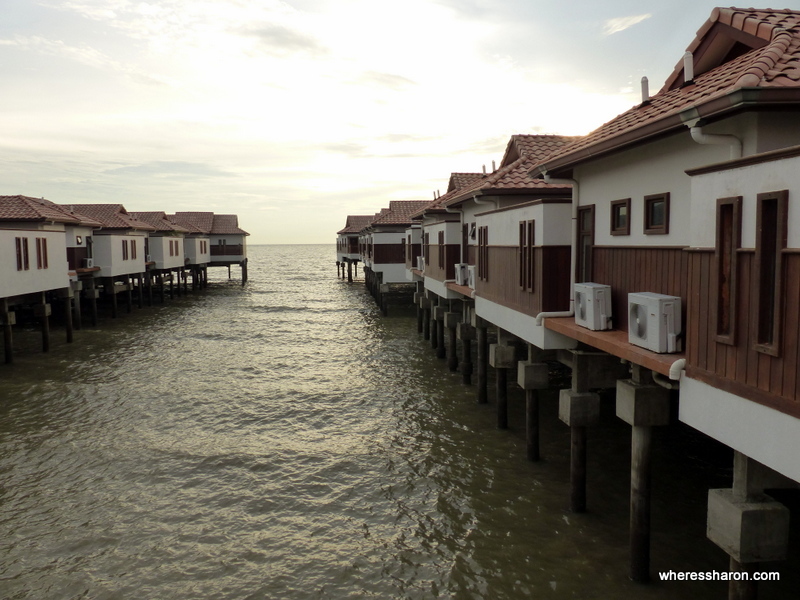 If you are looking for hotels near Sunway Lagoon theme park then this is very easy! There are a few different ones connected to the theme park as well as a huge shopping centre. 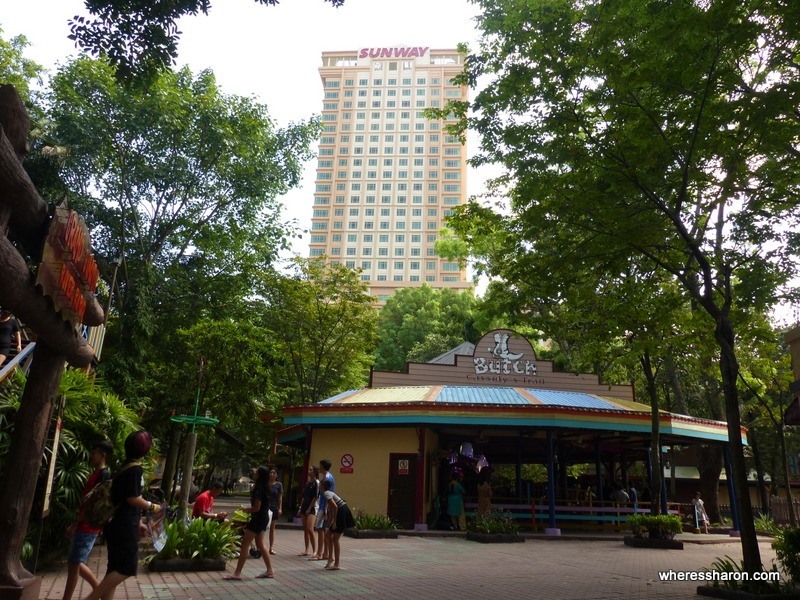 It’s easy to get to Sunway Lagoon from Kuala Lumpur so you don’t have to stay in one of the hotels near the Sunway Lagoon theme park. However, it does make for a great stopover and we loved staying on site. The Sunway Pyramid shopping centre on the same site is also great with tons of eating options, shops and activities of its own. We enjoyed visiting The Parenthood (a play centre), going to the cinema, ice skating and going on some little kid rides inside the centre. 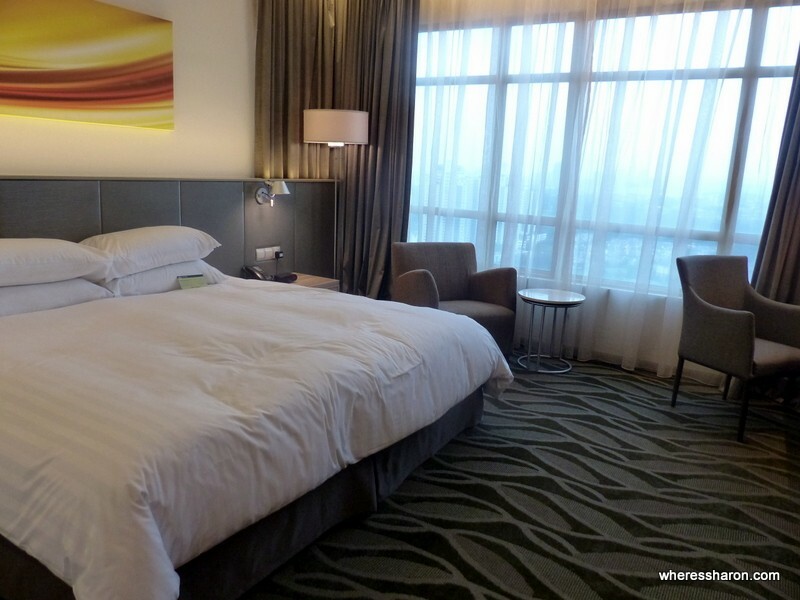 Staying at one of these hotels makes for a super easy weekend away or a stopover from KL airport. The Sunway Clio Hotel is a new hotel in Sunway Lagoon only a few minutes’ walk from the main entrance. We stayed in two connecting rooms that were clean, comfortable and as new. 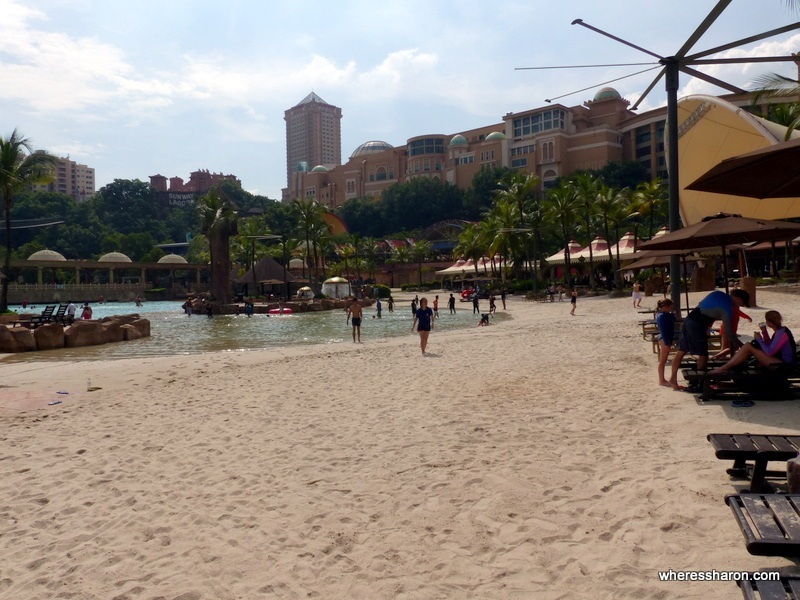 The base of the hotel leads into the shopping centre so it is also a very easy hotel nearby Sunway Lagoon. There is an infinity pool and gym. The buffet breakfast is great and worth including with your hotel stay. There is also room service but we preferred eating in the Sunway Pyramid shopping centre. Read about nearby attractions in our full guide to Kuala Lumpur here. Disclaimer: This article contains affiliate links. This means if you make a booking after clicking on one of these links that we may receive a small commission at no extra cost to you. Thanks for supporting this site. Hi Alana! I think it would be tough with you alone as the 3 year old would need you to go on many of the rides as often under 1.2m had to be with an adult. If you were happy to stick to the water parks and animal park, you could still have a great time though. Thanks so much for the detailed review. May I ask 1 question: if we stay in one of Sunway hotels, will we be free for park entrance? Hi Nhi! No, you need a ticket for the park as well. Hi Sharon, your reviews are great for us who travels with small kids. 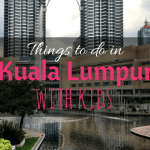 We shall be visiting KL within a couple of months with our 3 year old boy. Do you think it will will be wise to visit Sunway lagoon theme park with him? or should we abandon the idea? Thank you a comprehensive review. Loved every part of it. Will be going with my kids – 1 & 3 yrs old with their grandparents. It definitely will be a fun family day. ❤ Thank you again. Thanks for the review. Definitely gonna go to Sunway Lagoon after this! Sunway lagoon is so nice and whole day activity. However the tickets are so expensive. Need to look for some deals.